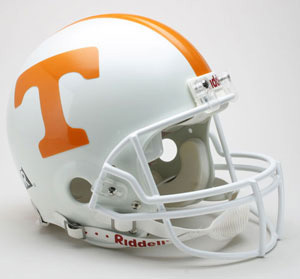 Officially licensed University of Tennessee Volunteers NCAA replica mini helmet with interior padding, 4 pt. chinstrap, and official shell colors and decals. The perfect autograph helmet. Measures 5" tall. 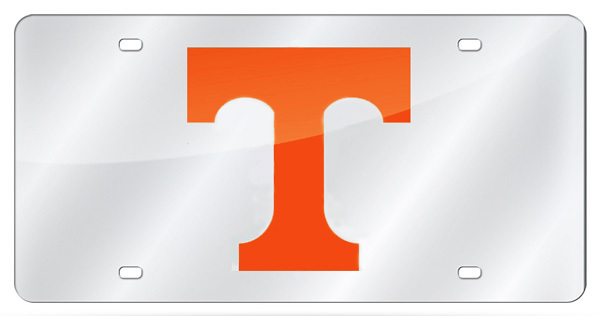 University of Tennessee Volunteers - NCAA Laser Tag / Mirror License Plate. Officially licensed NCAA 6" x 12" acrylic mirror license plate with University of Tennessee Volunteers team logo laser engraved in the center. Made in the USA. 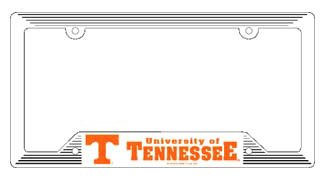 University of Tennessee / Plastic License Plate Frame, by WinCraft. Officially licensed plastic NCAA license plate frame, usable as a fan decoration on the outside of a standard car license plate. The University of Tennessee frame is molded in durable plastic and is designed around the California standards for tab and sticker clearance. Made in USA. Officially licensed Tennessee Volunteers NCAA 3" x 12" decal strip. Decal strips can be placed on a variety of surfaces, not just a bumper, with their self-adhesive back. Made in USA. Officially licensed University of Tennessee NCAA premium acrylic keyring with colorful graphics. Made in USA. Keyring measures 2.5" x 2.25"
Officially licensed University of Tennessee Volunteers felt NCAA pennant. Made in USA. 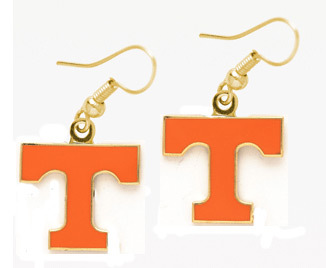 Pennant measures 12" x 30"
Officially licensed NCAA gold wire earrings with University of Tennessee team logo in hard enamel modern cloisonne. 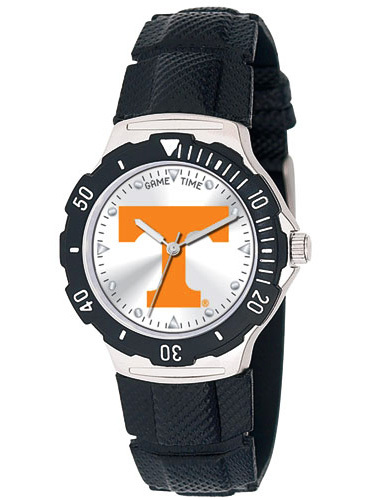 This officially licensed University of Tennessee NCAA adult watch features: stainless steel case back, adjustable textured PVC band, water and shock resistant, quartz accuracy, rotating bezel, and University of Tennessee NCAA team logo on the face. Limited lifetime warranty. Tennessee Volunteers - NCAA National Champions 2-Sided House Banner Flag. Officially licensed University of Tennessee NCAA two-sided 28" x 40" house banner, made of heavy-duty 150 Denier polyester, with 1.5" pole sleeve for hanging. This Tennessee Volunteers house banner also has a liner, which allows the flag to read correctly from both sides. Durable and weather resistant. 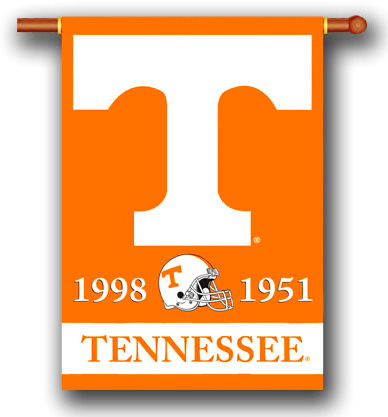 University of Tennessee - Tennessee Volunteers NCAA 3' x 5' Premium Flag. Officially licensed University of Tennessee NCAA flag made of heavy-duty polyester, with 2 heavy-duty metal eyelets for flying outdoors. This Tennessee Volunteers flag makes a great wall decor indoors. 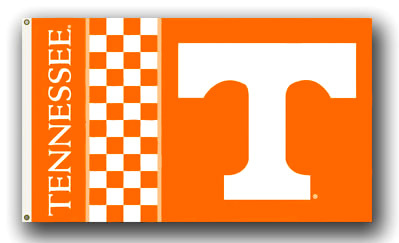 University of Tennessee - Tennessee Checkered NCAA 3' x 5' Premium Flag. Officially licensed University of Tennessee NCAA flag made of heavy-duty polyester, with 2 heavy-duty metal eyelets for flying outdoors. This Tennessee Volunteers flag makes a great wall decor indoors. University of Tennessee / Neyland Stadium Framed and Matted Panoramic Photograph. This officially licensed NCAA panorama photo is of Neyland Stadium (34 Yard Line) in Knoxville, home of the University of Tennessee Volunteers, on October 27, 2001. 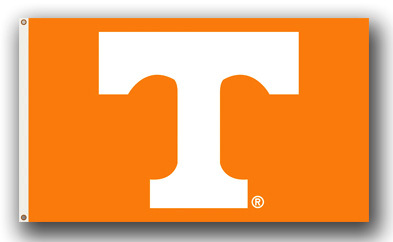 Tennessee defeated South Carolina 17-10. The deluxe panorama features black double matting and your choice of black or cherry frame, with a 1" x 4" engraved brass nameplate. Actual size is 40" x 14"